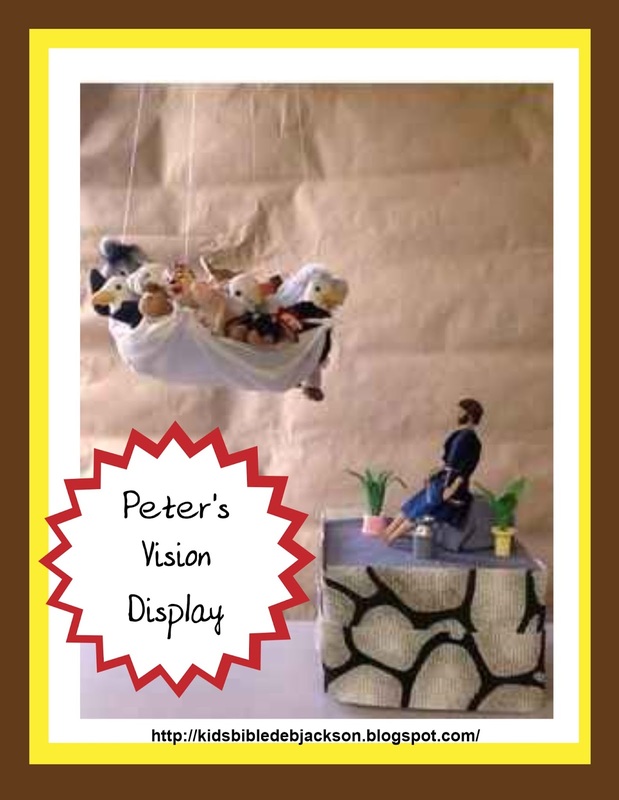 Our lesson today takes a look at Peter's Vision . We will talk about the Old Testament laws concerning clean and unclean animals. 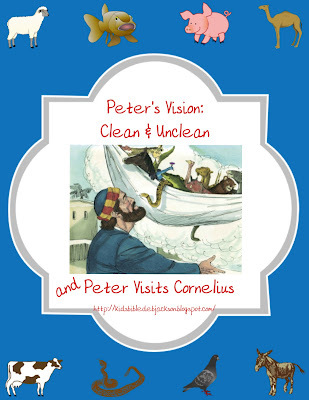 And, we will also learn about Peter visiting Cornelius. There are a couple of puzzles for today's printables. The Bible scripture can be found in Acts 10:1-48 and today we are studying about Cornelius. He lived in Caesarea and was a centurion (captain of 100 men) of the Italian Regiment (military). He was faithful and feared God. He gladly gave gifts to the poor and he prayed a lot. About 3 in the afternoon an angel of God came to him and said “Cornelius.” He was scared when he saw the angel! The angel told him that God has heard his prayers. The angel told him to "Send for Simon Peter and he will tell you what to do." The angel left and Cornelius told two servants and a soldier to go to Joppa to get Simon Peter. It was a 10 hour trip. When they went into the house, all the people that Cornelius had invited were there to greet Peter. (Acts 10:24) God sent Peter to teach Cornelius and his family. Peter told them that God doesn’t show favoritism. Everyone is treated the same in every nation that fears Him and is faithful to Him. Peter told them about Jesus and how He died. He said that we are commanded to preach to all people so all can go to Heaven. These posters are more of a teacher's visual when discussing clean and unclean and were used with the above student handout chart of clean and unclean animals. Remember, this is intended for early elementary and is not an in-depth adult study on the laws God made for clean and unclean. There is a very basic outline that can be used with the posters and this lesson. Click here to download. I use this display with this lesson. Click here to see more with instructions. I also send a note home the week before for the students to bring 2 of their favorite stuffed animals (no dolls, animals that God made smaller than 12") to use today. Click here for an updated reminder note you can print in color or black & white. Click here to see how we use their stuffed animals. This is an updated worksheet using the questions from the puzzles below. This is an application worksheet that can be used as a conversation starter for this chapter. This includes the black and white only and a teacher's answer sheet. Click here to download. These Fill-in-the-Blank Puzzles are facts from Acts 10. The scriptures are on each puzzle and the puzzles are slightly different so they can only be connected together. I used the detective theme graphics for the IFA: Investigating Facts in Acts since the students will be searching Acts 10 for the answers to fill in. I give them envelopes or zipper bags to keep the pieces together. Click here to download this set of Cornelius puzzles in color. Click here to print the puzzles in black & white. As I was working on the first set of puzzles, I wanted to add a puzzle with the steps of salvation. We have the Bible as our manual. These steps are written in more than one place in the New Testament, some are written about together and some are not, so I used the scriptures in the book of Acts, since that is where our study is. And, I used Paul's reference to staying faithful since we will be studying him. Click here to download the puzzle. Each week for this series of Acts, I will have something for the students to add to their IFA bag, Click here to see more. Some items will be purchased and some will be printables. This week's addition is the above puzzles. I used investigator graphics on the review puzzles. The students filled in the blanks, cut them out, and will store them in a quart size baggie. You can see this lesson with several different ideas here. Isn't it great that we don't live under the law anymore??? It's so important to teach children that. There are a couple of laws I am really thankful we don't follow anymore! Thanks for the comment! I really like the puzzles, these are fantastic! Thanks Jill! Thank you for stopping by! Thank you! We are loving your site for our Wednesday night kid's class. The kids really love the questions with the pictures to circle the right answer. Brilliant! Appreciate this so much!